1Hr Business Cards Ready in 1 Hour for shipping or pick up. Luxury cards available. Self-Inking Stamps (Rectangles) Different sizes and shapes with ink colour choices. Flyers Popular and Economic way to advertise. Design online. 24Hr Business Card Need some Premium/Luxury Business Cards next day? Order now; Ready in 24 hours. Brochures High quality brochures printed and folded to your need. Choose from many sizes. 1Hr Flyers Ready in 1 Hour for shipping or pick up. Many sizes availble. 4"x6" Postcards Postcards are the most economical and effective way to promote your business. 1Hr Postcards Ready in 1 Hour for shipping or pick up. Many stock options available. Promotional Items Promotional Items can have your company noticed. Order yours and save. Roll up Banners Easy carry, low investment, high visibility self standing roll up banners. 31.5" wide; 79" height. For Sale Sign The most popular real estate advertising tool. Printed on premium quality 10mil corrugated plastic. 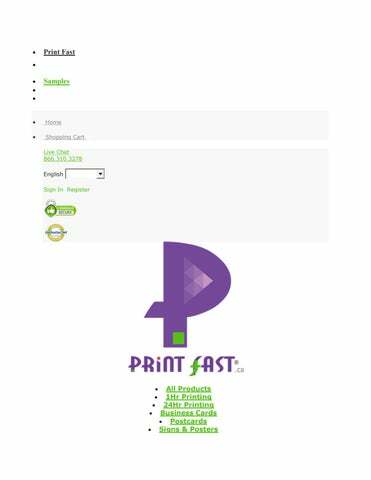 How can we help you to Print Fast? Enter your info below to begin.